* The advertised Lease is a rental-purchase agreement for new merchandise. Unless you exercise your Early Purchase Option, to acquire the merchandise you must make 52 weekly payments of $4.00 (plus tax & delivery), for a $208.00 (plus tax & delivery) Total Cost/Total of Payments. This includes a $135.88 Cash Price3 and a $72.12 Cost of Rental. The Wi-Fi Internet radio features a large touchscreen color LCD that provides fast and easy navigation through the icon-based menus. 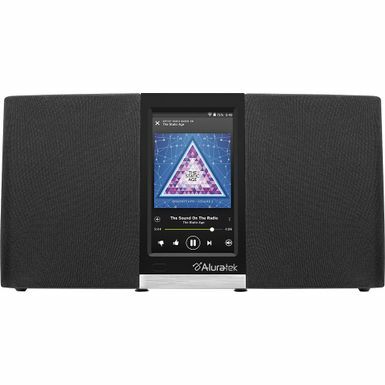 The LCD displays vivid menu screens and album artwork and gives you the same ability to search for stations, pause and play music, rate songs, choose favorites and create playlists just as if you were viewing a web interface from a smartphone or tablet. AIRMM03F boasts a downward firing and robust subwoofer complimented by dual front-facing channel speakers to provide great sound quality and amazing listening experience in a small yet powerful footprint. 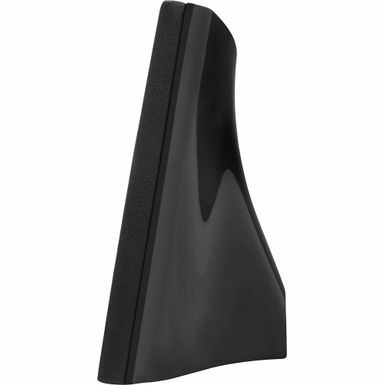 It is ideal for instances where you want to add audio quickly and easily to a room. 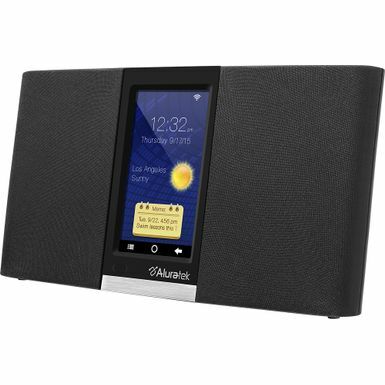 Wherever it goes, you can be sure the Wi-Fi Internet radio will fill any room with dynamic, rich sound. In addition to the touchscreen display, you can control the Wi-Fi Internet radio with the push button controls on top of the unit that allow you to power on/off, control the volume, press the snooze bar, activate voice command, go to previous menu and get back to the home screen. The Wi-Fi Internet radio alarm clock connects easily to the Wi-Fi 802.11 b/g/n wireless network so you can instantly enjoy thousands of digital music and radio content. You can also connect a PC, or other music source to transfer MP3 directly to the radio's built-in internal memory. A headphone jack is conveniently located at back to listen in private. The alarm clock function features programmable alarms so you can wake to your choice of dozens of alarm tones. You can also customize alarms as daily itinerary reminders. There is no limit to the number of alarms you can preset. The snooze bar button is located at top of the Internet radio.